The rumors have long held that Microsoft is indeed working on a Surface Phone, but it hasn't really gotten much beyond rumors and speculation. This time though, a reporter is claiming to have seen evidence at Microsoft's headquarters directly proving that a Surface Phone is still in the works. Unfortunately, we just have the word of the reporter to go on. Luckily, the reporter in question is David Pierce, formerly with The Verge and currently working for Wired, so he's a pretty reputable source. According to Pierce, Microsoft was in the process of building a prototype phone "a few machines away" from where Microsoft was building the Surface Book laptop. Pierce didn't directly say it was the fabled Surface Phone, but he also didn't indicate that it was in any way related to Lumia branded phones, and the prototype was being built by the Surface team, which means a lot. Still, if it is only in prototype phase, we would expect that the earliest we might hear an official announcement by Microsoft on a Surface Phone would be in 2016, which matches up to an extent with the timeline on previous rumors. Although, the rumors that the Surface Phone might be announced in early 2016 seem unlikely, because Microsoft would need to be past prototyping and on a final design by this point in order to hit that window. Wishlist : 5.5 inch full HD IPS NEO or OLED display with at least 73% screen to bezel ratio 20 MP back camera with larger than usual pixels, OIS, dual tone LED flash and either PDAF or laser AF 8 MP front facing camera capable of 1080p/60fps video The usual quad stereo microphones Magnesium body USB Type C port Snapdragon 820 3500 mAh battery with Quick Charge 3.0 At least one front facing speaker Choo Choo! All aboard the hype train. I probably wouldn't buy it but this should troll the iPhone Plus series just as the Surface Pro line stole the iPad's thunder. Replace overheating 820 with Intel Broxton and I am in. That's excessive RAM on a windows phone, completely unnecessary and driver in manufacturing costs. it's a surface... a pocket PC. I wouldn't want USB Type C now. I would rather wait when it's more common and less expensive IMO. "wait when it's more common". At the speed in which the tech world moves that could be next year. I would love to see wp interface, and x86 apps in continuity mode. And when you run them on the phone, you get two options. One would be like, not optimized you sure you want to run, and if you are plugged into continuum, it just works. Apple is doomed: 820, the all powerful continuum, cho-chi-cho-all-aboard, Microsoft inbound! If the Surface phone, for what we aspire it to be, was introduced in the last event, would sure have taken the thunder away from the Surface Book. Anyways, lets see if Microsoft has something really good up their sleeve to make us 'fall in love like we've never before' in tomorrow's event in Brazil. "and the prototype was being built by the Surface team, which means a lot." Just for the record, perhaps the author doesn't know or just he forgot the fact that now there is actually no "surface team" and "lumia team" they're now all one team under Panos Panay's leadership called Microsoft Windows & Devices team, so yeah.. I don't see the point! So why did microsoft buy nokia in the first place? They only wanted its patents! First the removed nokia branding Next the sack nokia staffs Now there are building a phone on their own without nokia Microsoft just killed the company. This happens all the time, hell google did it just the same. Stripped said company of patents then sold them off. Do I like it? No. But no hard feelings. Pfft so many people asking for a Snapdragon.... What fools. The reason I dislike the 950 XL is because the garbage Snapdragon CPU. This phone NEEDS an Intel CPU, the Willow Trail SOC (Skylake) with 4GB+ of LPDDR4 memory, a 128GB+ 3D V-NAND storage that is expandable with a MicroSDXC slot, and a USB Type-C port. That would be the perfect phone. YES. Thank you! I was shaking my head looking at all these wish-lists with the 820 as the SOC until I saw your post. If you put in an 820 all the surface phone would become is a metal Lumia 950. The point of the surface phone is to really bring home continuum with a desktop pc in a compact body. That's what the surface is about. Spot on. If the Surface Phone is intended to reinvent the smartphone space, it needs to run x86. Then with Continuum it IS actually a pocket PC that can run the entire windows catalog of apps. If we can get a surface pro 4 for 900 bucks, with everything it offers. 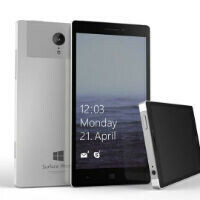 I am completely confident they could do a 700 buck surface phone. 6in display usb-6....or a proprietary connector that can act like an adapter for any connection, usb mini-micro-C etc.. HDMI out (maybe) 20MP or so, as long as its good pictures Intel Soc 8GB Ram 64GB Rom SD Card Surface like keyboard attachment/cover.